—John Heilpern, Contributing Editor, Vanity Fair. —Judson D. Hale, Sr., Editor-in-Chief, Yankee Publishing. —Elizabeth Pochoda, Editor, The Magazine Antiques. —John Hanson Mitchell, author, The Paradise of All These Parts: A Natural History of Boston. — The Wall Street Journal. “Clocks ruined time. Such a declarative statement seems out of place, a complete contradiction. Yet, when people attempted to control time, plan time, co-opt time, yes, even tell time, time actually lost its place. You see, time and place go together. You cannot have one without the other. “When” and “where” are uttered in the same breath. Indeed, physicists tell us that matter, space, and time must exist together; one cannot be apart from the other two. What difference does all this make? Humans have unwittingly given jurisdiction of their lives to digital readouts; we are servants to the time-clock. In so doing, place is torn from its moorings; time became a commodity, dragging space with it. One must thank Howard Mansfield for dragging us back. Turn & Jump is a marvelous rollick through periods where place mattered. Diarists begin the tales as people who mark their days with the distinctiveness of time wedded with place. Pithy proverbs such as “clocks are a fiction we accept in order to get on with our day” and “once time was a river, now time was money” dot Mansfield’s pages. Over and over Turn & Jump—a metaphor for the tempestuous life of vaudevillians hustling money within short stretches of time over the long haul of place—tells tale after tale of history which has lost its historical significance…. — James A. Rousmaniere Jr., editor, The Keene Sentinel. Like most history teachers, I spend my days trying to lure students into awareness of their deep, embedded relationship to the past. 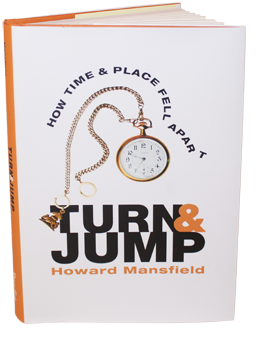 With the concluding line of his new book, Howard Mansfield suggests a new strategy: “Throw out your clocks.” Our clocks have come to obscure time itself, he believes. “Time is curved, time is braided.” It spirals, twists, mists, rains down. To discover time—to discover yourself in it—seek paths beyond the timeline. Turn and Jump: How Time and Place Fell Apart is full of them. Chapter by chapter, Mansfield takes the reader deeper into worlds familiar and strange, illuminating both this historical process and its human cost….But this is not a political book except in the deepest sense; Mansfield stays clear of the fruitless ideological blame-game, an indulgence for which it is way too late. His inquiry rather takes him into the soul of the civilization that imagined and countenanced such changes. For someone relentlessly critical of herself and always pursuing paths to improvement, that’s a comfort. Once you think about wabi-sabi, you see if everywhere — in art, design, music, food, even just the way some people live… Koren says later in the book that to achieve a wabi-sabi aesthetic in art and life, one should, “pare down to the essence, but don’t remove the poetry.” Simple but incredibly difficult, and a quality of much of my favorite literature. I would say that Howard Mansfield is one author who achieves that balance perfectly. Mansfield’s writing is lyrical and figurative, but clear and simple. This synthesis of history, sociology, and personal reflection makes Turn & Jump both contemplative (like wabi, which Koren tells us “refers to the inward, the subjective”) and informative (like sabi, which “refers to the outward, the objective”). Ranging from vaudeville (where the title comes from) to an outlet dam on a small lake in New Hampshire to a family store in a small town, covering everything from the standardization of time to suit railroad schedules to the nonlinear view of time held by native peoples, Mansfield guides readers along routes of inquiry well researched but never dry. Mansfield is a great writer, and a great thinker. Read his book and you’ll feel as if you’re talking with your smartest friend. "On an October morning, when the air and light was like a tonic, I sat in a museum of stilled machines and old filed papers, the only visitor. I sat at a desk between two clocks. A grandfather clock was behind me and an office regulator clock, with a large pendulum, was in front. The clocks ticked loudly; they ticked in unison. Clock-clock-clock. I could feel the pendulums swing in my gut. Everything else in the museum was mute — the Model A, the steam-engine pumper, the children’s toy metal cars. The clocks were insistent. Time was ticking through me." • Turn and Jump has won an "IPPY:" Independent Publisher Book Awards, 2011. Silver medal, in the science category.